The jump from the iPhone 5 series's 4-inch form factor to the 4.7-inch display on the iPhone 6 is a big change that might not appeal to everyone. Thankfully, Apple offers a 14-day return policy, and still continues to sell the 4-inch iPhone 5s and iPhone 5c, for those who might find themselves with an oversized case of buyers' remorse. 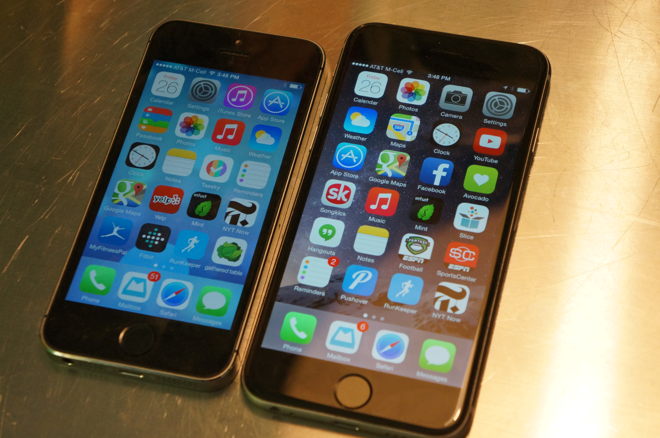 I really like the iPhone 6, but I want to love the iPhone 6. Unfortunately, in my first days of using Apple's latest flagship phone, I have found myself struggling to come to grips with it. As someone who has made efforts to cut down on jangling keychains and oversized wallets in my pocket, and who never used a protective case on their iPhone, I like my phones small. Frankly, my purchase of the iPhone 6 was an apprehensive one. And the gigantic iPhone 6 Plus wasn't even a consideration. After spending a week with the iPhone 6, I've discovered that pocket space isn't my issue —loss of control is. You see, the iPhone 6 is a wonderful two-handed phone. It's light and thin and feels great. The screen is gorgeous. Typing is also much easier —as long as I have two hands free, of course. 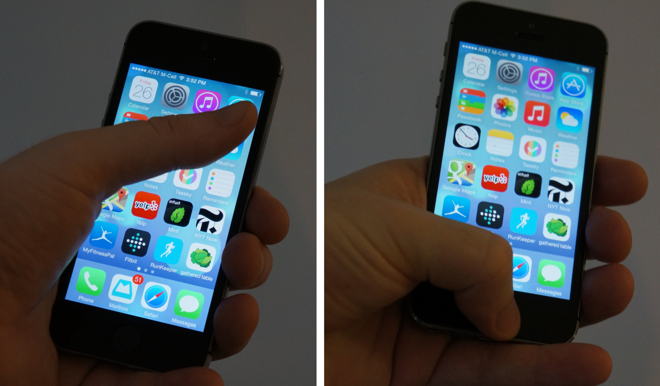 But holding and controlling the iPhone 6 with one hand is both frustrating and precarious. Having used an iPhone since 2007, I've become accustomed to holding my handset with a sort of "death grip." I've never used a protective case on my iPhone. I didn't drop my iPhone, and never cracked a screen, because I could securely grip it. The iPhone 5s "death grip," safe and secure without a case. But gripping the iPhone 6 with one hand results in loss of control. And that loss of control means it may not be for everyone. A bigger iPhone didn't always seem inevitable. When the first iPhone was released in 2007, its 3.5-inch screen was one of the largest on the market. "Smartphones," at the time, weren't very smart at all. Things quickly began to shift, though, and in a race to outdo the iPhone, competitors packed in more features; early high-speed cellular radios, for instance, that drained battery at a considerable clip. To compensate for this, smartphones started to get bigger, because a bigger phone can hold a bigger battery. Of course, no one wants their phone to get thicker, so it was the display that grew. More screen space means more room for a larger battery in a "candybar"-style handset. And while jumbo-sized phones may have initially been introduced to consumers for different reasons, in the end people liked and even preferred them. Big, bright, beautiful screens display more content, are easier to type on, and make activities such as watching a movie far more enjoyable. 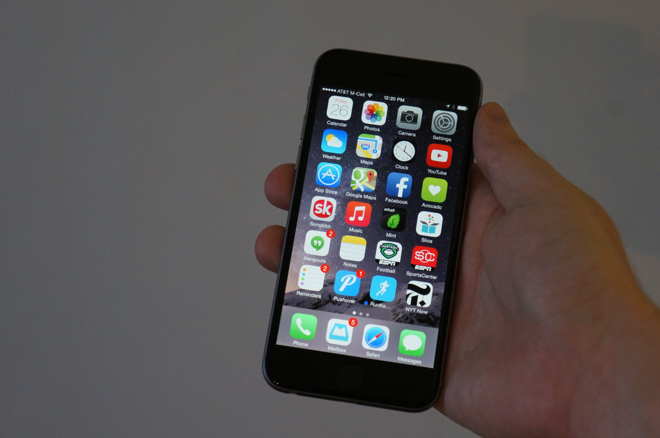 Cradling the iPhone 6 one-handed to reach more of the screen. It turns out a lot of people don't mind carrying a "phablet" in their pocket. By the time it launched in 2013, the iPhone 5s had the smallest screen size of any flagship smartphone on the market. The world had changed for the bigger. The truth is, Apple was leaving money on the table by not catering to consumers who prefer larger screen sizes. Though the company prided itself in offering one-handed smartphone usage, consumers indicated they were willing to sacrifice that convenience to gain the advantages of a bigger screen. In the end, a bigger iPhone became inevitable. My first week with the iPhone 6 has shown me that my traditional one-handed "death grip" that kept previous iPhones secure isn't going to work anymore. 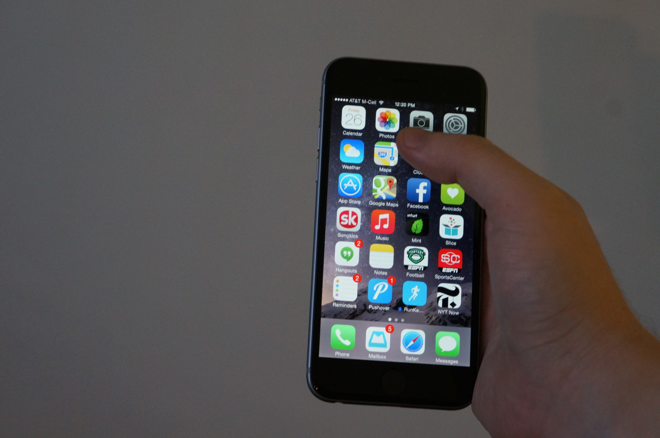 Squeezing the iPhone 6 between my palm and fingertips restricts my thumb too much. Instinctively, I will still pick up my phone and grip it in this manner before realizing I cannot reach where I want. Apple has attempted to compensate for this with its new "Reachability" feature that brings the display down to a more manageable area for a single screen press before automatically re-expanding. 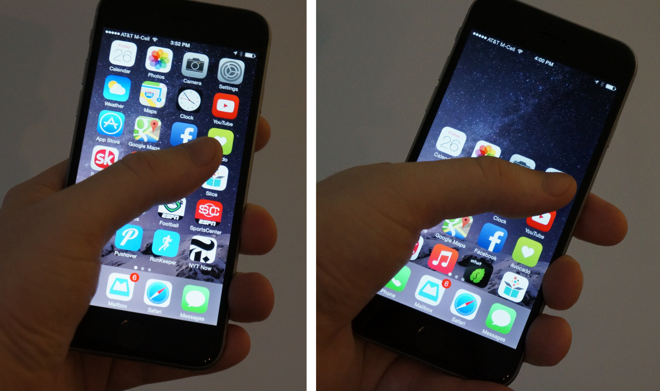 Reachability aids one-handed use, but it's a somewhat clunky fix. I'm glad Reachability is there, but I don't find myself using it. It's unnatural and somewhat inconvenient, and it doesn't work with some functions like handling banner alerts for notifications. Instead, I've found myself adjusting my grip to reach the top of the screen. But even there, old habits die hard. Using the iPhone 6 with one hand works best when cradled— not squeezed —with my thumb positioned about halfway up the screen. This allows me to extend my palm to allow my thumb to reach the top far corner of the display, while also keeping the home button at the bottom accessible. To have this much reach, I simply cannot comfortably grip my fingertips on the other side of the phone. Maybe people with bigger hands than me could manage, but my relatively normal-sized hands are not capable of this. 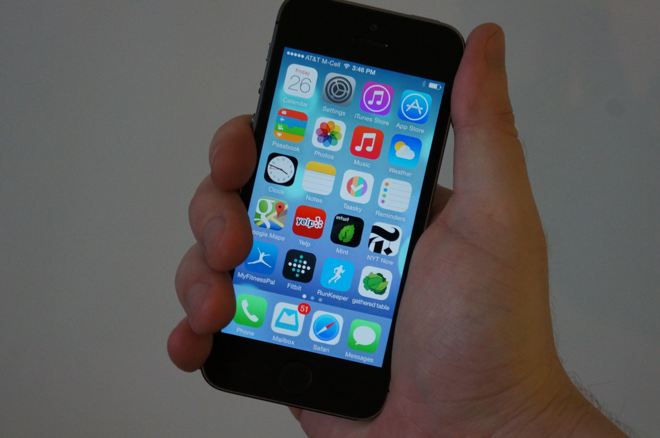 Cradling, not gripping, an iPhone 6 feels precarious. Instead, I'm forced to rest my iPhone 6 on my fingertips. No more death grip. It feels like dropping it is inevitable. Thankfully, it's not all bad. 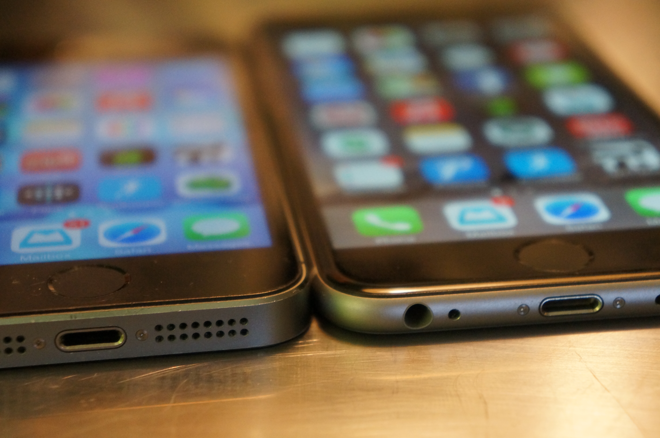 Apple's decision to adopt rounded edges with the iPhone 6 is a welcome change. I hadn't fully realized how uncomfortable the chamfered edges of the iPhone 5s were in my hand before spending a week with the iPhone 6. Similarly, the rounded edges of the display are also a fantastic change. Side-screen gestures, like swiping to go back in Safari and other iOS apps, feel much more comfortable with these softened edges. The rounded edges of the iPhone 6 are more comfortable than the sharp chamfered edges of the iPhone 5s. Moving the lock button to the right side of the iPhone 6 does take some getting used to, but after a week I've adjusted. Here again, my biggest problem has been my grip: I've found myself squeezing both sides of the phone to lock it, which on numerous occasions has led to me pressing one of the volume buttons at the same time. Simultaneously pressing the lock button and a volume button prevents the phone from being locked. It's only been a week, but I'm adapting. My iPhone 5s is still around, and I've been switching between the two phones. Every time I go back to pick up the iPhone 5s, I'm torn. The smaller 4-inch screen is much better for one-handed use. It just feels right. The chamfered edges stick out too, though. They never bothered me before, but now they do. 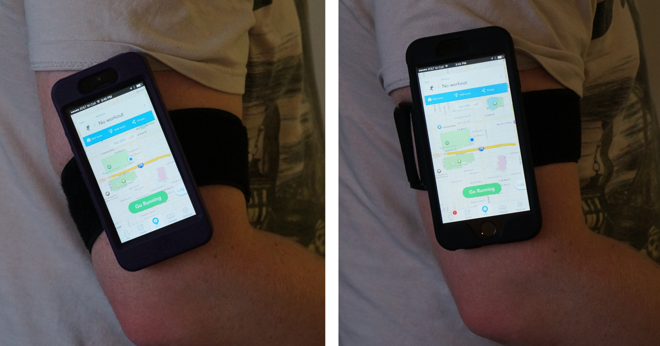 In a pocket or in an armband, the iPhone 6 doesn't feel much bigger. In the hand, it's a different story. Some iPhone 5s, iPhone 5c or even iPhone 5 users will try the iPhone 6 and they'll want to stay put. The screen size is a big change, and I imagine a fair number of people don't want it. For those switching from another platform, or from an even older iPhone with a smaller 3.5-inch screen, Apple still offers the iPhone 5s in capacities of 16 and 32 gigabytes. The iPhone 5c is still around too, for those who don't care about Touch ID. Both are still great phones, and will make compelling options for many users. But how much longer will the 4-inch size stick around? It's beginning to look like the end, and I've decided to adapt. I am going to stick with the iPhone 6, but mostly because it's something of a necessity. I write about Apple for a living, and owning the company's latest and greatest technology is an important part of staying familiar and current. But to be fair, there are other reasons I'm sticking around. Apple Pay is around the corner, and I'm looking forward to being able to pay for things with my phone. The NFC-based Apple Pay won't support previous-generation handsets like the iPhone 5s. 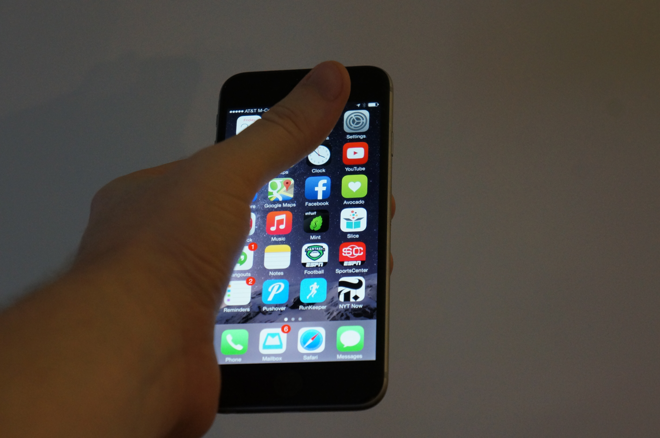 Reaching the entire iPhone 5s screen while securely gripping it is not an issue. The larger screen does make it easier to type with two hands. The improved camera, even though it protrudes, is a nice upgrade. The rounded edges of the iPhone 6 make holding it and performing edge swiping gestures more comfortable. And the beefed-up A8 processor that powers the iPhone 6 helps seal the deal. But in testing the iPhone 6 for a week, every time I went back and picked up my iPhone 5s, it felt nice. It fit securely in my hand, and it felt more manageable. Prior to the launch of the iPhone 6, Apple was the only company making first-class smartphones with smaller screens in the 4-inch range. Today, it's still making those phones, but in the form of previous-generation models. Extinction feels imminent. Is the 4-inch screen size now in Apple's rear-view mirror? Maybe. But after spending a week with the iPhone 6, I've realized that I would like a handset with its same design— aluminum back and rounded edges —featuring a smaller screen. I'm guessing I'm not alone. Users looking to upgrade who are reluctant about the screen size of the iPhone 6 should try for themselves and keep an open mind. I found myself worried about pocket space, but in the end came away more concerned with usage. Apple has a 14-day return policy, so those with buyers' remorse can always change their mind. The upgrades and improvements in the iPhone 6 are too significant to ignore, but ultimately, for some people, may not offer enough to justify the jump. I'm staying put with the iPhone 6, and, for the first time ever, I will probably put a protective case on my handset, for fear of dropping it. In that respect, the iPhone 6 is less of an upgrade and more of a compromise. Here's hoping that, in the years to come, Apple compromises, and doesn't forget about us one-handers.